Former Olympic champion-turned-reality television star Bruce Jenner was recently involved in a horrific, fatal crash that left one woman dead and several others – including children – injured. Authorities are reportedly delving into all possible causes, and Jenner is said to be cooperating with the investigation. Among the avenues explored: Drunk driving (authorities do not suspect that at this time), paparazzi interference (officers say that is unlikely, though they did capture images of the four-vehicle crash as it happened) and texting while driving (an accusation Jenner has denied). The chain reaction crash occurred shortly after noon on a Saturday in Malibu. Authorities say the driver of a Toyota Prius suddenly stopped and was struck from behind by a Lexus. Jenner, who was driving his Cadillac Escalade, was behind that Lexus and rear-ended the vehicle at an angle (possibly attempting to swerve to avoid collision). However, the impact of that crash pushed the Lexus into oncoming traffic, where it was struck by a Hummer H2. The driver of the Lexus was pronounced dead at the scene. In total, five children and two adults were hospitalized with injuries. Jenner was not among those injured. As with any multi-vehicle collision, it’s imperative for injured parties to retain legal representation early in the process. 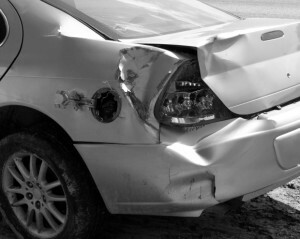 Insurance companies tend to look at each crash as a separate incident, and there may be liability on several drivers, depending on the circumstances. Generally, the law holds drivers who strike another vehicle from behind are prima facie liable, simply by virtue of the fact they were following too closely. By this logic, the deceased driver of the Lexus could be found at least partially at-fault. Yet, her estate may still pursue legal action against Jenner, who struck her from behind. However, there could be evidence presented tending to indicate the driver of the first vehicle was not operating safely. Whatever comparative fault any of the injured drivers had would reduce the amount of potential damages they/the estate could collect, but it is not a bar to recovery. Authorities say Jenner successfully completed field sobriety tests and passed a blood-alcohol test. Now, they are attempting to glean information from his phone that might indicate whether he was texting at the time of the crash. Although photographers captured images of the crash in real time, those shots are seemingly inconclusive with regard to whether Jenner was on his phone shortly before or at the time of impact. A challenge in many such cases is pinpointing the exact time of the crash. Seconds can matter when attempting to determine whether phone activity was a factor. It’s estimated at least 23 percent of all crashes involved the use of a cell phone. The minimal amount of time one’s attention is taken away from the road while texting is five seconds. If the driver is traveling 55 mph, that amounts to the length of a football field. Texting while driving is illegal in Massachusetts, but the law is only sporadically enforced. While several police departments do hold enforcement campaigns, an average of just 2,539 citations have been issued for texting and driving each year since the ban took effect. That works out to about five tickets for every 10,000 drivers in Massachusetts.